The Dana is one of the more intriguing Shrewsbury place names, especially for visitors! It starts as a walkway from Castle Street, continues round the Castle and across the railway, and then becomes a street skirting the Prison until it merges with Victoria Street. The Dana (pronounced ‘Danner’, not ‘Darner’) is named after Rev Edmund Dana (1739-1823), who was Vicar of Wroxeter, Eaton Constantine, Harley and Aston Botterell, all apparently at the same time! He did not live in any of these places, however, but in Castle Gates House, the black and white house near the Castle entrance. He had a reputation for being a very eccentric character, but he was a magistrate and also a Trustee of the body responsible for the upkeep of the town’s streets. Hence his interest in improving the rough path that wound around the Castle. How he himself got to be there is also a convoluted path! 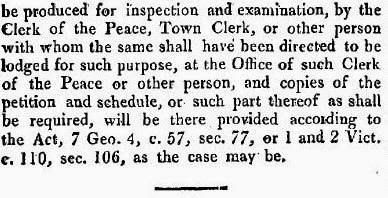 In December 1840, a few months after his incarceration, William Dana was out of prison and living in lodgings, still on half-pay from the army, and now running a printing business. Some months later his case was adjourned. I have found no further mention of Dana’s bankruptcy in the newspapers. I assume William Dana discharged his debts or made some accommodation with his creditors. However, it seems that Dana’s finances never recovered, for at the time of the 1851 and 1861 censuses, he was living with his married daughter and her husband in a terrace house on Holywell Terrace in Shrewsbury. This was quite different from his previous address of Roughton Hall, a 3 story brick mansion near Worfield, Shropshire. Bankruptcy featured a lot in Victorian literature, and of course Charles Dickens‘s character of Mr Micawber in David Copperfield immediately springs to mind. (We Australians are pleased to note that Dickens has Micawber emigrate to Victoria, where he becomes a bank manager and magistrate.) 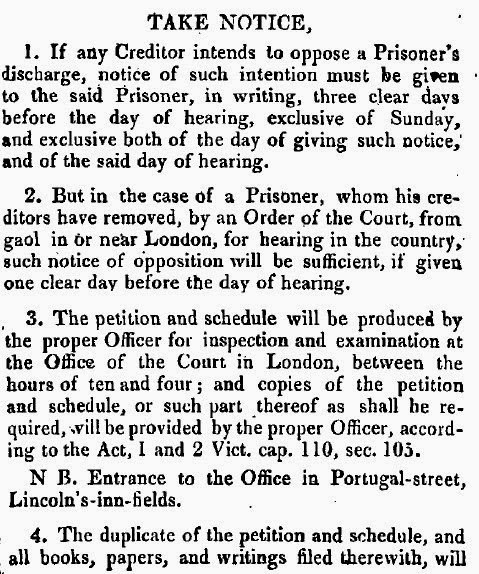 Micawber was probably modeled at least in part on Dickens’s father, John Dickens, who in 1824 was imprisoned for debt under the Insolvent Debtors Act of 1813. 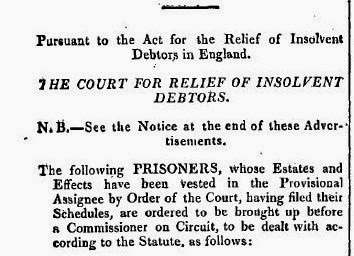 It wasn’t until 1869 that debtors no longer went to prison. 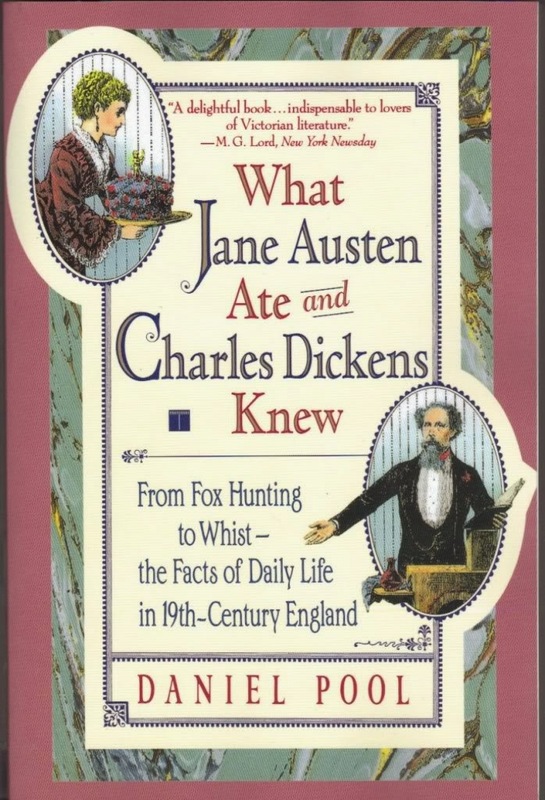 Daniel Poole’s ‘What Jane Austen ate and Charles Dickens knew‘ is fascinating on the subject of Victorian bankruptcy, debt and money lending. Pool, Daniel What Jane Austen ate and Charles Dickens knew : fascinating facts of daily life in the nineteenth century. Robinson, London, 1998. J for ‘jail’ or G for ‘gaol’? Both are acceptable English. ‘Gaol’ is the older term but ‘jail’ dominates modern English usage. Current Australian English favours ‘jail’. 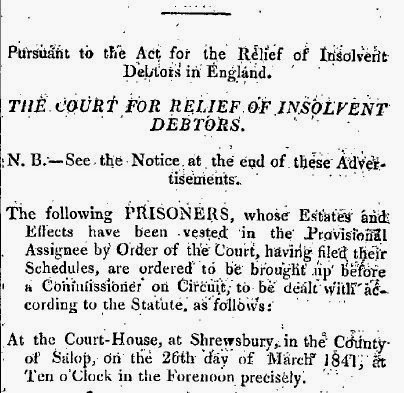 For a brief history of insolvency law in England the Wikipedia article at http://en.wikipedia.org/wiki/United_Kingdom_insolvency_law#History is useful.